His presentation was chock full of popular social media/community examples, many of which I’d seen before, but always interesting to see in aggregate. He also outlined how to approach the exercise in leveraging the groundswell with tips on setting objectives, understanding roles, measuring success with metrics, building a business case, etc. The high point of the presentation for me was his discussion related to what Forrester calls, “Social Technographics.” It’s basically a graphic representation of where customers are on the social media activity ladder. Additionally, Forrester claims to have analytical data that will profile your target customers’ social computing patterns by age, country, and gender (that map to the activity ladder). Check out the profile tool. Would be interested to know how they built this tool, but have to admit, it’s kinda fun. All of this and more is explained in the Groundswell book. You can get more resources at the Groundswell site. Nice high-quality video interview here with Andy in Tokyo. This video was originally shared on blip.tv by grl with a Creative Commons Attribution-NonCommercial-NoDerivs license. I’m headed out to SAP’s SAPPHIRE ’08 U.S. conference, this year held in Orlando. 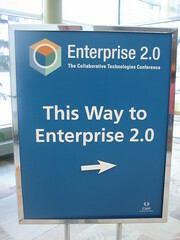 The conference is an annual pilgrimage for most of my Enterprise Irregular brethren. Over two dozen of us are going to the U.S. gig and will be given access to SAP’s executive leadership to get all our questions answered. So, why so far ahead in using the tools and so behind in offering them simultaneously? This is the single question on my mind as I arrive in Orlando. I’ll be flanked with smart guys, so I feel pretty safe. Most of us will be twittering from the conference. I will be respectful of the conference-spam factor and will only post items I think are uniquely important. If you have a question, you’d like asked of any SAP executive including Leo Apotheker and Henning Kagermann, just send me a DM to @ITSinsider on Twitter. I’ll do my best to get it answered.